Road to the Isles performs the pipe and fiddle music, dance, and folksong traditions of Scotland & Ireland. The group's five performers contribute their talents on the fiddle, flute, pipes, guitar, and with vocals, Irish Step dancing and Scottish Highland dancing. Dance performances include the sword dance, highland fling, sean triubhas, Irish reel and jig, slip jig, and hornpipe, all complemented by songs, stories, and instrumental solos and duets. Road to the Isles will transport your audience to the lochs and glens of the Celtic lands of old. Educational presentations cover a wide range of elementary school assemblies, with a trio of myself, an Irish step dancer and a Scottish Highland dancer showcasing bagpiping, singalongs, and Irish and Scottish dancing. Study guides are available for educators to supplement their students' experience. 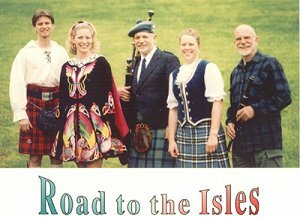 Road to the Isles also offers workshops or master classes on fiddle, flute, and/or bagpipes as well as Irish step dance and Scottish highland dance. Promo kits and photos are available for Road to the Isles's school presentations and concerts. Road to the Isles also provides a video tape for presenters.